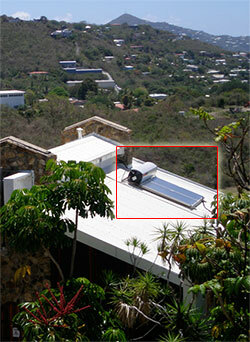 Solar water heaters make use of two natural phenomena for their operation: black objects absorb heat, and hot water rises. It is a simple system, and the only moving part is water. Will I always have hot water? 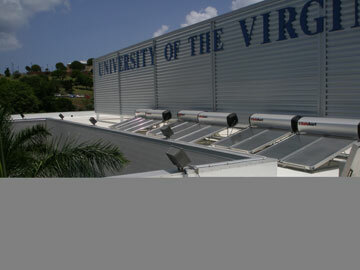 solar energy being collected by the absorbers. All Solahart systems carry an extensive warranty and our Free Heat Thermosiphon systems are available with an extended warranty. The high efficiency black polyester powder coated absorber maximizes the transfer of available solar energy while the closed circuit design makes it suitable for any area. The sun heats the water, and this “circular” path continues. 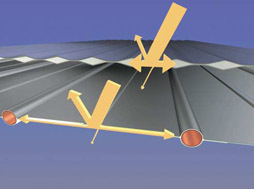 When the sun’s heat is no longer present, the thermosiphon effect stops, and hot water retained in the storage tank stays hot because of the tank’s high density insulation and design. The double ceramic lined tank has been developed for long life and features additional protection for longer lasting performance. 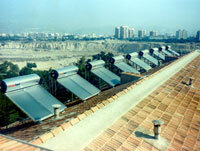 We use two of Solahart's three main types of systems: Roof mounted thermosiphon systems and Streamline pumped systems. in the future)? Do you currently run out of hot water? How large is the dwelling? Where do you live? 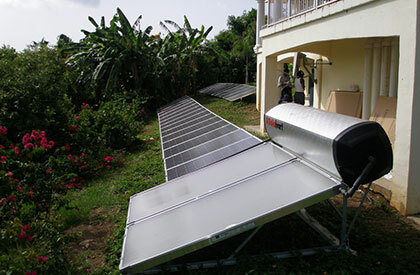 Essentially Solahart commercial hot water systems come in two forms; central storage systems and multiple roof top storage systems. Central storage systems are generally recommended where usage exceeds a hot water draw of 1,500 litres per day, whereas roof top systems are normally regarded as suitable for installations requiring less than 1,500 litres per day.